I'm starting today by sharing a totally random comment from my Mr 5 to his Miss 7 cousin. "I'm going to get this strawberry, stick it in cat poo and put it in your ear". He's a real charmer isn't he, but he makes me laugh every day! Onto the polish now, I have a couple of polishes from Naild'it indie brand. This is another new indie brand for me (and that's not hard given the eleventy billion indie brands available now). Mountain Fizzle Doo - This polish was inspired by the drink Mountain Dew. Now I've never even tried Mountain Dew, but I'm guessing it's green and fizzy. 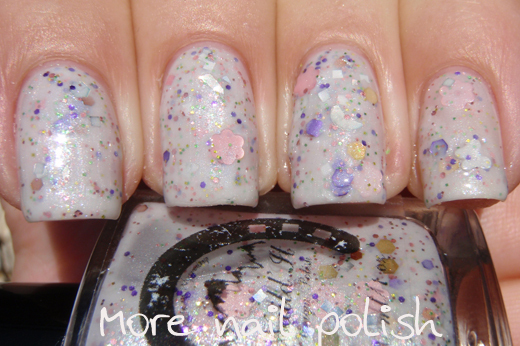 This polish looks quite creamy, but it's jelly enough to have the glitters from previous layers showing through. I used three thin coats for these photos, taken in full sun. 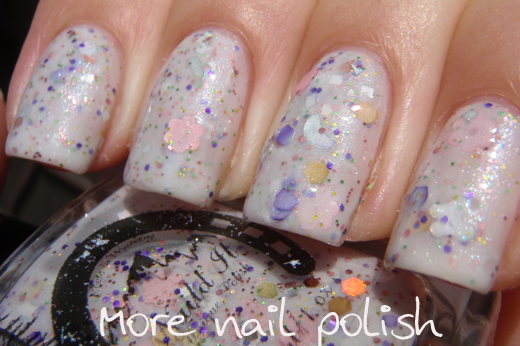 Spring Fling - This polish is spring in a bottle. There are silver butterflies flying around the pink flower glitters as well as the gold and purple highlights that remind me of a handful of wildflowers. This was three coats photographed in the full sun. Both polishes were easy to apply and and all glitters were smooth and flat. 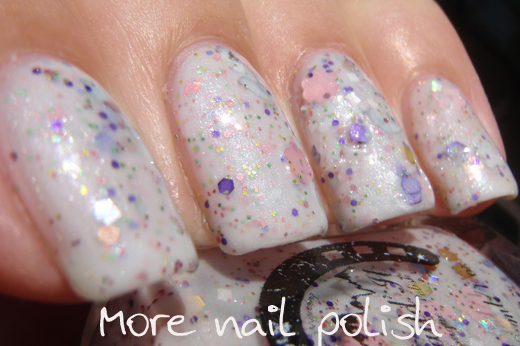 I love glitter polishes that don't have to be layered on top of something else. These feel a bit wrong for the season for me, but I will certainly be pulling these out again in about 5 months when spring pastel fever hits me again. Naild'it unique polishes are available from her Etsy shop (when open) and through Llarowe. you've never had mountain dew?? oh my goodness it's my favorite! These look lovely on you; they're perfect for our spring here. lol! I've not bought anything from this brand for about a year, but that might change soon. It's so hard to keep up with all the indies! I love Mountain Dew, but it's the colour of piss. Nothing like the nail polish at all! Cute polish though. Ha ha - Mmmmm, you really sold me on wanting to taste something the colour of piss!! This made me laugh!